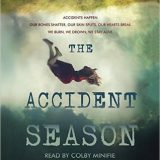 The Accident Season by Moïra Fowley-Doyle was not on my radar until I read a review from a fellow blogger. Then an opportunity to review the audio version with Colby Minifie reading presented itself and I jumped. I am so delighted that I did so as the Accident Season was beautiful, dark, mysterious, and quirky.